Be inspired by these free tattoo fonts that you can put to use in your body art designs. Choosing a tattoo font is a big deal – last thing you want is to have the wrong design permanently inked on your skin, right? Good news is, there are designers and typographers all over the globe creating amazing tattoo fonts, and there are many that won't cost you a penny. But where do you start? 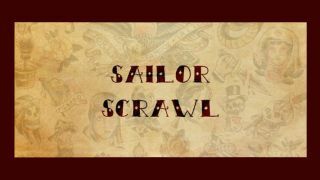 How do you find free tattoo fonts in a style that you love enough to have put on your body? We've scoured the web to find you the top free tattoo fonts for designers, and if you need a bit of inspiration on your overall design, be sure to take a look at our round-up of the best tattoo designs and some more out-there tattoo art. Apostrophic Labs' Xanax is a solid-looking 3D font with more than a touch of graffiti swagger, and just the thing for a tattoo font that stands out from the crowd. It features upper and lower-case characters, and it's free for all uses. Who can resist a bit of rustic love? Get some rustic love in your life with this jolly little tattoo font from Chequered Ink that's free for personal use and charities. It also works as an acceptable alternative to Comic Sans. Ginga is an inky tattoo font from arch-script typographer Billy Argel. It is on the grungier end of the spectrum, with its destroyed aesthetic – and don't forget to use the > and < symbols to create the tails. Ginga is free for personal use, but you can buy it for commercial purposes from $39. This South Pacific-inspired tattoo font by Imagex Fonts is really brought to life by its tribal designs within the letterforms. It's free for personal use; contact Imagex if you want to use it commercially. Jonathan Harris is a veritable font monster, with over 433 fonts on FontSpace and more than 11 million downloads to his credit. For a taste of his skills, check out Always Beside You, a slightly scratchy script font that's perfect for tattoo designs and free for personal use. This one caught our eye because it shares its name with Fred Deakin's old band; free for personal use, it's a big and friendly-looking script font created by Billy Argel. This calligraphic font from Maelle.K and Thomas Boucherie is gloriously scratchy and perfect for taking the edge off a too-serious script tattoo. It's free to use, but contact the designers if you have any commercial plans for it. Swish, painstakingly-designed tattoo fonts are all well and good, but sometimes you want a tattoo that looks like it was done in prison with a contraband blade and a ballpoint pen. If so, step up this awesome set of old-school ink from Woodcutter. Want a bit of retro class? Get your '90s on with this collection of eye-catching tribal designs, featuring plenty of Celtic knots, stylised dragons, spirit insects and spiky abstract designs. Get that nautical look with this salty hand-drawn font from the Out of Step Font Company. Each letterform features a little diamond, and it's free for personal use. We love the bold strokes of this new decorative font from British studio Chequered Ink. Inspired by Maori tattoos, this fantastic tribal font is free for personal use, you can purchase a licence to use it commercially. Inspired by old-school lettering, designer Rafa Miguel created tattoo font MOM. "I'm a big fan of American traditional tattoos, this is a just a tribute to the great artists that use this style," he comments on Behance. MOM is available for free for both personal and commercial use. The first of a number of stunning scripts in this list designed by talented fontsmith Måns Grebäck, Reditum is a calligraphic font that's guaranteed to add a touch of style to your designs. Free for personal use, it comes complete with a number of glyphs and standard ligatures. This slick tattoo-style script font has a cheeky touch of graffiti to it. Designed by Vicky Mardian and Måns Grebäck, a full commercial licence will set you back $59 but you can download a free demo for personal use. Angel Tears, by Billy Angel, boasts a gorgeous hand-drawn feel. With 128 characters – including upper case, lower case and punctuation – it'll add a distressed look to your designs. A playful upper-case tattoo font, Tribal Dragon was created by prolific font designer Jonathan Harris and is free for personal use. Created by Dieter Steffmann, this tattoo font is licensed as freeware, which means that – unlike most on this list – it's available for both commercial and personal projects; no questions asked. Crosses are a staple of tattoo design, and this dingbat font by Spanish designer Woodcutter brings together a range of brilliant designs that you can download for free. Designed by BoltCutterDesign, Precious Regular is a traditional, calligraphy inspired tattoo font that you can download today. The graphic design company has also created a wide range of free fonts, so be sure to check out its site. Pentagon is a less traditional free tattoo font offering but by no means is it dull. You can download Pentagon for free if it's for personal use – we think plenty of you'll have fun experimenting with this design. Designer Nick Curtis has produced over eleven hundred fonts – almost five hundred of them freeware fonts, which have been downloaded and enjoyed by over three million people worldwide. This free tattoo font entitled Spring, combines the illustrative elements of tattoo designs with the traditional, calligraphy style typography that is often etched with ink. Going with the more handwriting font style, Rose is free for any personal design work. Featuring only capital letters, this is one of those tattoo fonts that's perfect for headlines and eye-catching straps. Consisting of both lower case and capital letters, VTKS Tattoo font is a mix of old and new style tattoo typography. As is often the case with downloads of no-cost tattoo fonts, the creators would appreciate donations and so if you do end up using it, we'd encourage you to be generous. This cute font comes in capital letters that makes for a brilliant headline font. The subtle additions to each letter make this one of the more fun and playful tattoo fonts we've seen, and will provide plenty of typography experimentation. Extra Ornamental No. 2 is a fancier approach to tattoo fonts, with its extra attention to detail, swoops and shading. As a 'busier' font design, it may only work in bigger scales. Davide Cariani is a UX designer and web developer with a passion for typography. True Love was created in his spare time and is his first type experiment. It was inspired by old school tattoo typography; glyphs available include letters, numbers, dash and dot.